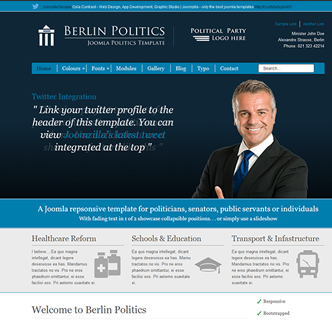 Milan Consultancy, a responsive & bootstrap Joomla template ready for your business. 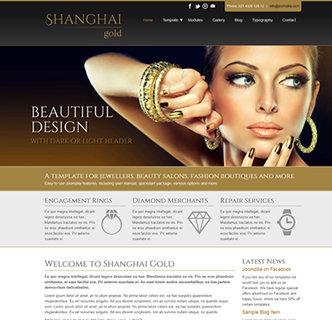 Checkout this stunning professional theme which comes packed with extra's, allowing you to setup your new business website easy. Click on the "Homepage 2" and see how you can get a different style to your website, by simply adding some content to the "logoRight" position and moving the slideshow to a different position. As you can see from the demo of this template (click on the image to view) there are multiple social media feeds, with the demo pulling Facebook and Twitter feeds and displaying them on the homepage, making it easy to update your Joomla website and keep ot refreshed. The professional logo you see in the demo can be used for your own purposes, and comes in vector format. There are multiple colour choices, 11 in total and also the option of multiple clinically light backgrounds, all configurable from the template manager. Along with the social media aspects of this business style Joomla template you get social media links to your accounts on various sites as also in-built social media sharing capability's. 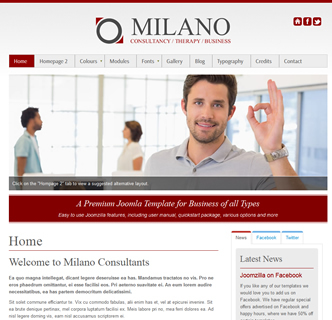 Milano Consultancy is a responsive Joomla template so it looks great on mobile phones and tables, all this in an excellent Joomla theme for an incredible price. Use it today if you are looking for a Joomla template for your business, training course, therapy unit, consultancy firm or corporation. A stylish cafe/kitchen/bakery joomla template with various customisation features to suit your needs. 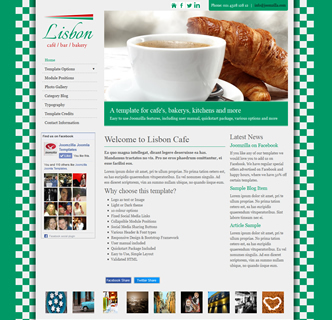 This easy to use Joomla template is inspired by one of the coffee capitals of the world, Lisbon. With a effective and simplistic left sided navigation menu this Joomla template allows you to place your links underneath your logo, along with your Facebook or Twitter profile, all remaining stagnant on your website if you wish. 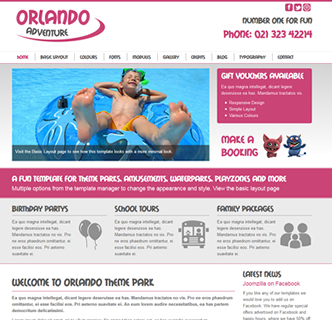 The complete template is responsive and looks wonderful on mobile phones, tablets or other non standard devices. Using Bootstrap technology this template retains all its elements and features on smaller devices and the content is displayed in full effect, even the slideshow - which can also contain text on each slide if you wish. Showcase your latest products for sale or photographs on the homepage in one of the collapsible "base" positions, share your website using the in-built social media sharing buttons or allow others to access your LinkedIn Profile or YouTube Page all directly from the template options. Lisbon Cafe is the best Joomla template for all things kitchen, and with its easy to use layout system and in-built options such as colour and backgrounds it's as versatile as you want it to be.